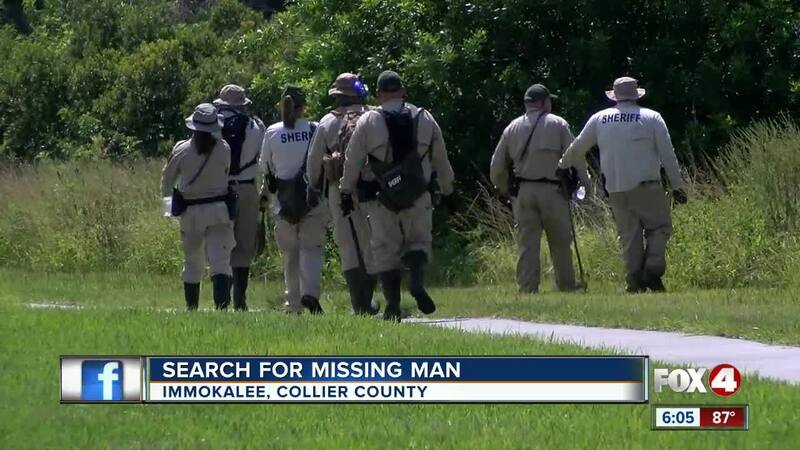 Deputies in Collier County conducted a massive in Immokalee for missing 81-year-old Jean Hyacinthe. Hyacinthe was last seen at about 3 p.m Monday along the 700 block of Crestview Circle in Immokalee. Wednesday, a large staging area was set up at Lake Trafford Elementary School as deputies ramped up their search. K-9 units and Aviation units, as well as drones, were used to search for Mr. Hyacinthe. His daughter Carine Hyacinthe said their family had just returned to Florida on Monday after going to a funeral in Haiti when her father went out for a walk. She said he has become forgetful over the past few years, and likely got lost. "The past three days, with no food, no drink...I don't know where he is," she said. "He's not that strong to hold on all those days." Searchers said the heat and humidity is a dangerous factor for a missing person in the area, especially if they are elderly. "Somebody his age, without food or water for several days...that's a major concern," said Corporal Efrain Hernandez of the Collier County Sheriff's Office. Some deputies searched for Jean Hyacinthe through fields on foot Wednesday, while others took four-wheel ATVs and swamp buggies into the woods and swampy areas near Crestview. Cerine Hyacinthe said her family is grateful for the massive effort to locate her father. "I leave it in God's hands," she said. Members of the public should call our nonemergency line at 239-252-9300 with any tips or information. Today the search for Jean Hyacinthe enters a new phase. The 81-year-old Immokalee resident has been missing since Monday afternoon. An extensive geographical search has been conducted in an area spanning several square miles and that has been searched multiple times. Resources devoted to this search included air units, drones, swamp buggies, ATVs, searches on foot in fields and woods and door-to-door canvases in neighborhoods. In addition to deputies, personnel with the Florida Fish and Wildlife Commission participated and Peace River K9 Search and Rescue contributed personnel and seven canines to the effort. Detectives will continue to follow up on leads, remain in contact with Hyacinthe’s family and work to develop new investigative leads. In addition, they will place DNA from family members into the National Missing Person Database. Hyacinthe left his apartment at 744 Crestview Circle on foot. He was last seen wearing a white and yellow-striped shirt, jeans and black shoes. If you think you've seen him or have information about his whereabouts, please call our non-emergency line at 239-252-9300.